The spring season is known for its vibrant burst of blooms, and even though the Western Cape has had more rainfall than last winter, water restrictions and high water tariffs are still in place. Worry not, a lot can still be achieved in your garden without wasting our most precious resource! We’re running a great buy-one-get-one-free-tree special throughout Arbour Week (3–9 September 2018). During Arbour Day on 7 September 2018, we’re giving away a free tree sapling when you buy a R17 bag of compost. Read our guide on how to take care of your tree sapling for great tips and advice. During the drastic water restrictions last summer, many plants and lawns have suffered. Our advice? Where plants have died, fill the gaps with waterwise plants. If you’re planting new beds or redesigning your space, we strongly recommend planning a drought-resistant garden so you don’t waste money on greenery that won’t thrive in dry conditions. 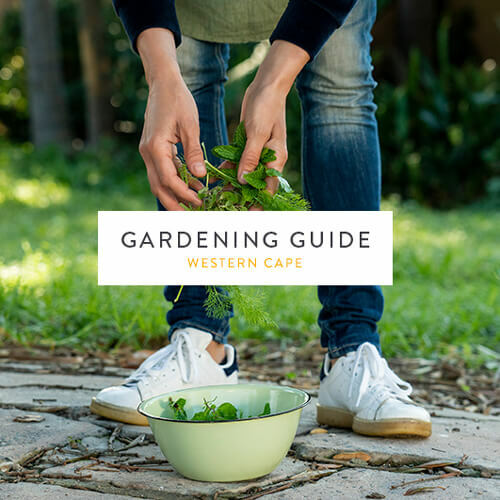 Waterwise plants to add to your nursery shopping list include succulents, fynbos, buchu, lavender, air plants, aloes and clivias. For all the urban farmers out there, you can save water by growing your veggies and herbs in containers. That way, you can control water usage. Vegetables on your September growing list should include beetroot, celery, corn, cucumber, brinjal, lettuce, melons, parsnip, peppers, potatoes, radish, tomato and watermelon. If your gardenias have yellowing leaves, treat them with iron chelate. Cut back fuchsias to encourage bushy growth. Mulch azaleas and camellias with well-rotted pine needles or bark chips once the flowers have faded, then feed with a high-nitrogen fertiliser. Spray roses with a rose cocktail made from one part Rosecare, one part Trelmix, one part Seagro, one tablespoon of vinegar and one teaspoon of dishwashing liquid. This will help to protect your roses against pests and fungal diseases. Buchu is part of the Rutaceae family, the same as citrus fruits. Native to South Africa, with a natural distribution restricted to the Western Cape mountain regions, buchu is an edible low shrub, approximately 1.5m high, with white, mauve or pink flowers that bloom in spring. They release an aromatic scent through the oil glands in their bright green leaves, and are used medicinally and in teas and cooking. Buchu is best grown in coarse, well-drained and deep soil, and needs full sun and a frost-free climate.